After the expulsion of the Columbans from China, a new region was opening up for the Society. Many of the predominately Catholic countries of Latin America had an urgent need for qualified priests, and the Columbans answered the call. In the early days of the Society, discussions had occurred about a Columban presence in Argentina, but it had not blossomed into a formal mission. Peru would instead be the first Latin American mission country for the Columbans. The first Columbans arrived in Peru and assumed responsibility for a parish on the north side of the capital city, Lima, called Pampa de Cueva. 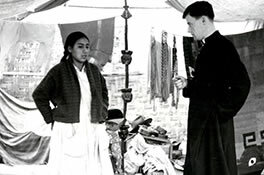 The Columban Sisters would arrive in Peru in 1963, opening clinics and providing medical care. Whereas the Columbans had been primarily a missionary society for Asia, they had now established a foothold in a new continent. More expansion in Latin America was to follow.